Citation Information: J Clin Invest. 2006;116(5):1254-1263. https://doi.org/10.1172/JCI27372. Autoimmune diseases are often precipitated by viral infections. Yet our current understanding fails to explain how viruses trigger organ-specific autoimmunity despite thymic tolerance extending to many nonlymphohematopoietic self antigens. Additionally, a key epidemiological finding needs to be explained: In genetically susceptible individuals, early childhood infections seem to predispose them to multiple sclerosis (MS) or type 1 diabetes years or even decades before clinical onset. 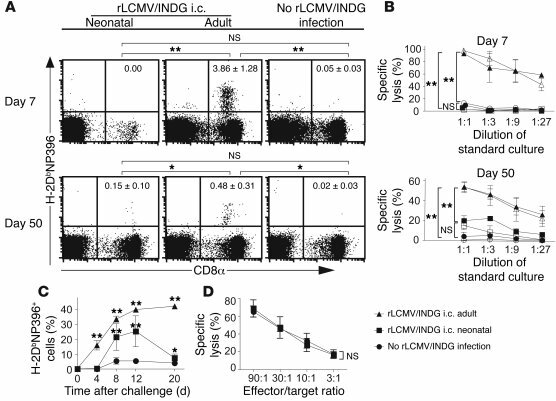 In the present work, we show that the innate immune system of neonatal mice was sufficient to eliminate an attenuated lymphocytic choriomeningitis virus (LCMV) from most tissues except for the CNS, where the virus persisted in neurons (predisposing virus). Virus-specific cytotoxic T cells (CTLs) were neither deleted nor sufficiently primed to cause disease, but they were efficiently triggered in adulthood upon WT LCMV infection (precipitating virus). This defined sequence of viral infections caused severe CNS inflammation that was histomorphologically reminiscent of rasmussen encephalitis, a fatal human autoimmune disease. Yet disease in mice was mediated by antiviral CTLs targeting an epitope shared by the precipitating virus and the predisposing virus persisting in neurons (déjà vu). Thus the concept of “viral déjà vu” demonstrates how 2 related but independently encountered viral infections can cause organ-specific immune disease without molecular mimicry of self and without breaking self tolerance. Inefficient induction of virus-specific CD8+ T cells in rLCMV/INDG carriers. (A) Neonatal and adult C57BL/6 mice were infected with rLCMV/INDG i.c. or were left uninfected. On days 7 and 50, NP396-specific CD8+ T cells in the spleen (day 7) and blood (day 50) were enumerated by flow cytometry using MHC class I tetramers (H-2DbNP396). Numbers indicate percentages of NP396-specific CD8+ cells within the CD8+ T cell compartment (mean ± SD of 3–4 mice). (B) Neonatal (rectangles) or adult (triangles) C57BL/6 mice were infected with rLCMV/INDG i.c. or were left uninfected (circles). Mice were sacrificed 7 and 50 days later, and NP396-specific CTL activity was determined after in vitro restimulation of splenocytes in the presence (filled symbols) or absence (open symbols) of rIL-2. Shown are mean ± SEM of 3–4 mice per group. Cultures with rIL-2 were not significantly different from cultures without rIL-2 (not shown). (C) Mice were challenged with ARM i.v. 50 days after infection as described above. The frequency of NP396-specific CD8+ T cells in blood was measured using MHC class I tetramers. Values differing significantly from those of ARM-challenged mice without prior rLCMV/INDG infection (circles) are indicated. (D) rLCMV/INDG carrier mice (50 days old) and naive adult control mice were challenged with ARM i.v. Seven days later mice were sacrificed, and the NP396-specific primary ex vivo CTL activity of splenocytes was measured. Shown are mean ± SEM of 3 mice. Specific lytic activity of naive control splenocytes was < 3% (not shown). Most panels are representative of 2 similar experiments. *P < 0.05; **P < 0.01.